Ahead of the Davos World Economic Forum, the first state visit by China’s President to Switzerland since 1999 was marked by an extremely worrying restriction of the freedom of expression. In Bern, Swiss authorities have blocked demonstrators carrying largely visible banners openly criticising China’s human rights records. Regrettably, the Swiss Government has now caved in to preposterous Chinese demands by banning any expression of dissent which would be visible to the Chinese delegation. Pro-Tibet campaigners in Switzerland have been blocked from protesting against an official visit to the country by China's President Xi Jinping. Swiss authorities imposed a no-protest zone in Bern, the Swiss capital, which limited where activists could gather while also applying a two-hour time limit. Despite the restrictions up to 800 people attended the event and 32 were arrested, mainly for defying the Swiss authorities' time controls. A man who doused himself in flammable liquid was taken by police to hospital. A spokeswoman for the Association of Tibetan Youth, Migmar Dhakyel, said: "We are really concerned [about] how our government, our own government, treats us [and] doesn't permit us to demonstrate." Dhakyel's sentiments were echoed by Swiss parliamentarian and Green Party President Regula Rytz, who addressed the gathered crowd and said the Swiss government should use Xi's visit to address human rights violations in both Tibet and China. Human rights organisation Amnesty International added their concern stating: "Bern’s decision to only allow a demonstration away from the view of the Chinese delegation must be viewed as a critical restriction on free speech and assembly rights." 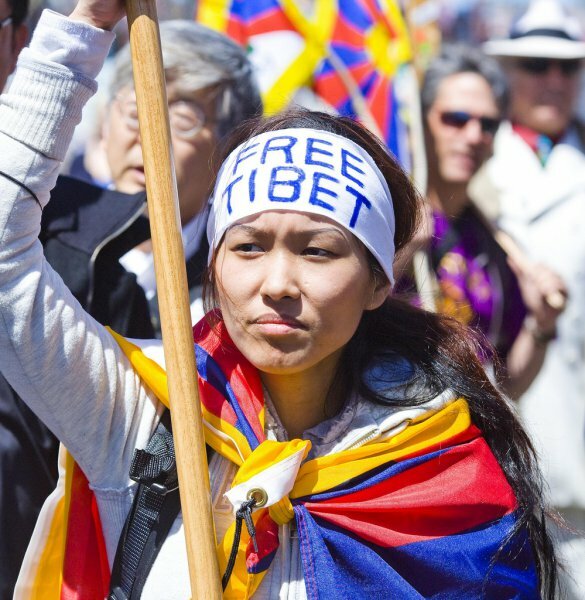 Many protesters carried signs stating "Free Tibet" and "Don't Deal With Killers" and included members of Switzerland's 6,500-strong Tibetan community, reputed to be Europe's largest. The first Tibetan refugees entered the country in 1960 becoming Switzerland’s first non-European refugees. The Chinese president - who attended a gala dinner held in his honour in the Swiss parliament alongside Swiss president Doris Leuthard and was flanked by armed, masked guards on his journey - is in the Alpine nation ahead of the World Economic Forum in Davos, a first for a Chinese president. Xi's visit is the first since 1999 when then-President Jiang Zemin arrived in Switzerland where he faced mass protests, including demonstrators who hung banners from rooftops overlooking the Swiss parliament. Zemin remarked at the time that the Swiss risked "losing a good friend". Similar protests in support of Tibet rocked state visits by Xi Jinping in Prague in March 2016 and in London in October 2015. Sino-Swiss business interests have been growing since a free trade agreement was signed between the two nations in 2014 with many firms in Switzerland counting the newly-enriched China as among their most important markets.